Presidential candidate Donald Trump has caught a lot of heat lately for comments he characterizes as "locker room talk." Football season… baseball season… none is as seemingly endless as election season. This one has been particularly nasty, brutish and long—and now, as Victor Wishna explains in “A Fan’s Notes,” it’s bullied its way into the sports headlines, too. Let’s face it—this is not exactly how Kansas City fans thought we’d be spending our October. The K is quiet, so is Arrowhead. The Chiefs didn’t play this week, and, well, they didn’t exactly play last week in Pittsburgh, either. Chiefs, Royals, even the Kansas City Mohels — that’s my fantasy team — aren’t providing much of a break from reality. And if ever there was a time we might want to be distracted, it is now. But if ever there was a time we shouldn’t be distracted, it is now. The parallels between modern sports and politics are easy to draw, perhaps never more so than in this election. Both are media frenzies driven by the latest results and standings in the polls, with cavalcades of talking heads who spin and prognosticate. Sports fans and political junkies alike worship at the altar of FiveThirtyEight — the website that made its reputation on accurate forecasts of winners and losers both at the ballot box and on the field of play. By this past weekend, the course and discourse of this election cycle had sunk to a level unlike anything we’d seen in modern American politics or sports — until one of the candidates drew a link. Of course, I’m talking about how presidential nominee Donald Trump dismissed his own braggadocious claims of sexual assault as “locker room talk.” People of all political stripes reacted with — well, maybe not shock, but certainly disgust, including those who make their livings in locker rooms. Prominent athletes from the NFL, NBA, and MLB responded with indignant interviews and a wave of tweets. The conversation was only beginning, as the new hot topic became, well, the talk of the locker room. Others admitted that, sure, a certain lewdness is common — because it’s a private place where the lowest common denominator thrives. In other words, it’s talk and a mindset that can debase a room, not the other way around. Others pointed out that the case in question didn’t even take place in a locker room, but on a bus, with live mics and TV cameras. As comedian/fake-journalist Trevor Noah put it best, “If you conduct locker room talk everywhere, it’s not the locker room, it’s you!" Of course, the problem is that there are too many who think this is what all men do, who don’t understand that this isn’t normal — or, more to the point, that it shouldn’t be. 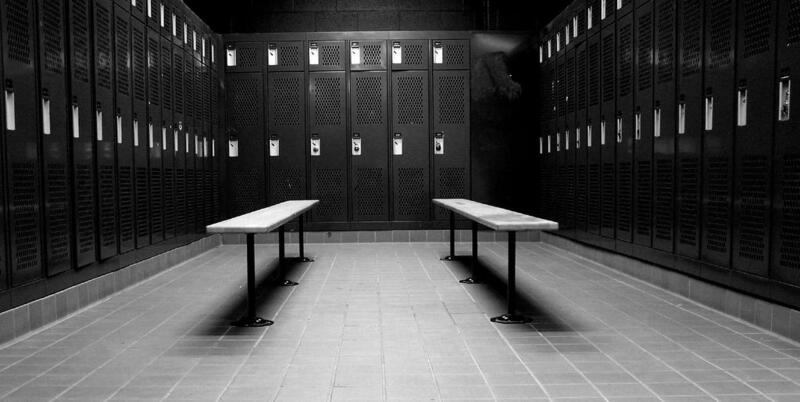 That’s why it’s heartening to see athletes and others speaking out — “If that's the talk you hear around you then be the place where change begins,” Conley tweeted later — and to see hashtags like #notinmylockerroom gaining traction. Of course, that’s no match for what happened Friday night when author Kelly Oxford tweeted about the first time she was sexually assaulted, at the age of 12, and invited others to share their own stories under the tag #notokay. More than a million women responded in just the first two days. Trump and his campaign have sparked a reckoning, exposing our society’s fault lines by so unabashedly crossing them — not for the first time, and with 25 days to the election, probably not the last. There are still many distractions — I mean, Chiefs tight end Travis Kelce has that new dating show on the E! Network, right? And I firmly believe that our teams will turn it around, and that the Royals will be back in the World Series next October. There’s a lot to talk about. There’s always next week. There’s always next year. But some conversations can’t wait. When Donald Trump explained his remarks on grabbing women as "locker room talk," some women responded by sharing their own stories of survival. Has the conversation on sexual assault and the casual objectification of women reached a tipping point? Plus, Question Quest finds out what's in the center of the United States. With the presidential campaigns reaching a fever pitch, the Media Critics discuss whether or not journalists hold Hillary Clinton to a different standard than Donald Trump, and if the press is giving political "spin" the same importance as evidence-based facts. Then, Bill Brownlee introduces Various Blonde in this week's Local Listen. First, local undecided voters react to the slug fest that was the second presidential debate. Then, a look at a few measures on the Missouri 2016 ballot concerning cigarette taxes and establishing ID requirements for voting. Pull into the Arrowhead Stadium parking lot for a Kansas City Chiefs game and what do you notice? Besides the plume of smoke from the barbeque grills, you can’t miss the sea of red. Not only do fans wear the colors, more tailgate vehicles display them. And, in recent years, more old school buses are converted into party buses. 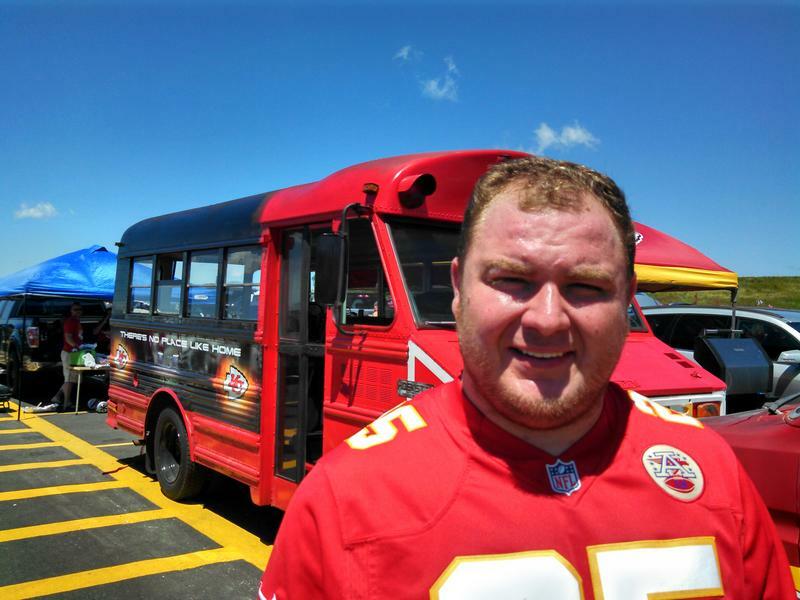 As time ran short before the Chiefs pre-season opener against Seattle on Aug. 13, Dallas Kidd and his co-workers used 30 cans of spray paint to transform a small, old yellow school bus into a party vehicle for Chiefs games.